Having defeated Aggramar we were pumped to to tackle the last boss in the instance. One click and a couple of "oooohhh weeeeeehhh aaaaaahhhhs" later Magni teleported us to the seat of pantheon. There we faced the tormented titan world soul Argus the unmaker. Expecting a long list of changes vs normal we were happily surprised that the differences were minimal and mostly affected phase 1 handling. After reshuffling how we handled phase 1 we started pushing along quite nicely and managed to get to the last phase quickly. The last phase certainly puts the pressure on as people were toppling over quite a bit faster resulting in quick dead life giving trees. Time ran out but surely the week after we could have a nice evening of progress on him and so we did. 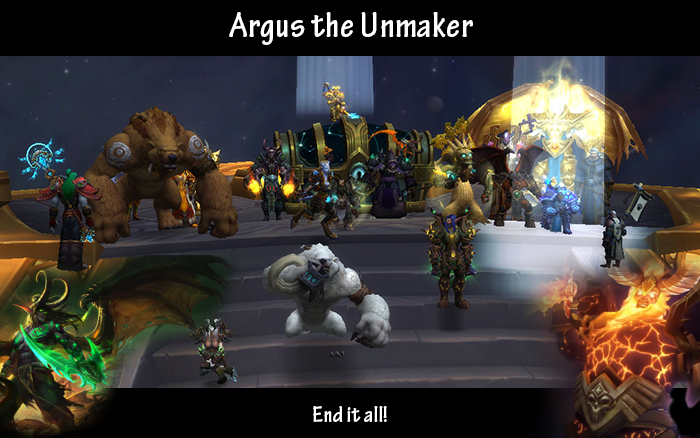 After initially struggling with phase 1 for some goes we managed to get past that point and soon after albeit with quite a dodgy finale we managed to kill Argus. Well done all we put an end to the legion. Illidan is on permanent vacation battling sargeras in a time loop and we get to enjoy a huge sword sticking inside our planet in silithus of all places. WoW:Legion has been an interesting grin..... journey and we resolved the storyline of one of the biggest threats in wow history. We will see what kind of adventures WoW: Cataclysm Battle for Azeroth will bring us.